Muslims Hope To 'Wake Up' At The Ballot Box This Year Though Muslims make up a small voting bloc, their votes can matter in close elections. This year, many feel a renewed sense of urgency to choose leaders that will represent them. Minnesota Rep. Ilhan Omar pauses while speaking during the Democratic Farmer Labor Party endorsement convention in Minneapolis on June 17. And there are more Muslims now running for office, hoping to be part of a "blue wave." In Minnesota, nine Muslims are on the ballot for state, federal and local offices. "Many candidates running for office are using Islamophobia as a means to get to political power. That is absolutely un-American," Zaman said. "The community is under assault. Fortunately, most of us are beginning to wake up." He points out that in Minnesota there are 50,000 registered Muslim voters. Though Muslims make up a small voting bloc — they're about one percent of the nation's population — those votes can matter in close elections. Many feel a renewed sense of urgency to choose leaders that will represent them. "You have President Trump, even as a candidate and obviously after taking office," said Wa'el Alzayat the head of Emgage Foundation, "espousing anti-Muslim views and stoking Islamophobic sentiment and signing into law what we consider to be a Muslim ban that unfairly targets people of our faith." Alzayat's organization works to increase Muslim political participation. 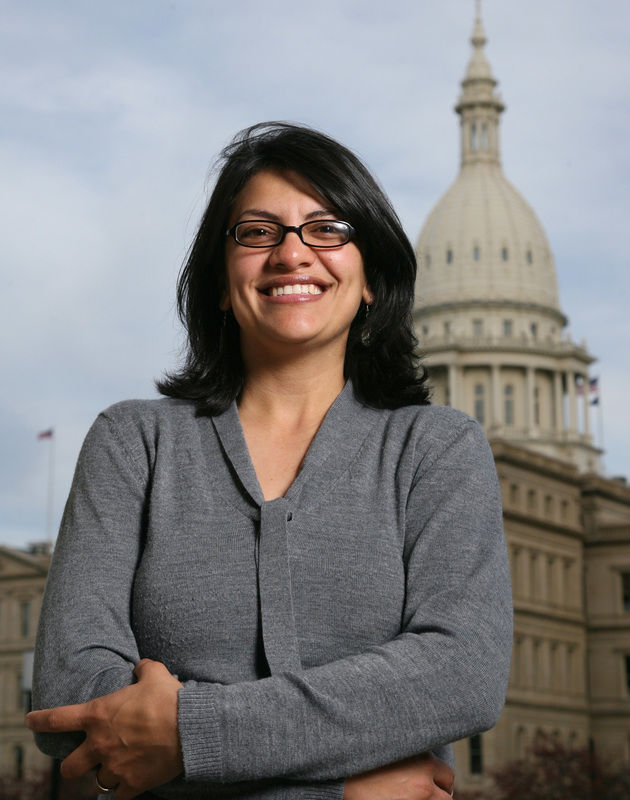 Rashida Tlaib is photographed outside the Michigan Capitol in 2008. Elected to the 12th District of the state House, Tlaib is the first Muslim woman ever to serve in the Michigan Legislature. This year Muslims could shift even more blue, Alzayat says. And while turnout is typically lower in mid-term elections than presidential ones, he says there are already signs that Muslims are planning to vote in bigger numbers this year. In some key states they could have an outsized impact. "What's interesting is that they are clustered in key areas including battleground states such as Virginia, Florida, Michigan, Ohio and especially in urban areas," Alzayat says. "So, for example you have about 120,000 registered Muslim voters in the state of Michigan. You have about 120,000 registered in Florida. You have about 100,000 registered in Virginia and those numbers really matter because in close elections ... just a few votes can make a difference let alone tens of thousands, if not 100,000." Minnesota elected the first Muslim man to Congress in 2006, Keith Ellison. He is one of two Muslim men in Congress right now. And now the state is likely one of two sending the first Muslim women. The other is Michigan, where Democrat Rashida Tlaib won her primary and is expected to head to Congress. Ilhan Omar is running for Ellison's seat. And Ellison is in a very tight race for attorney general. The Democrat's campaign has been clouded by domestic abuse allegations that Ellison denies and that his party investigated and said were unfounded. He's also running statewide for the first time and the state is less diverse then the district he currently represents. Omar won her primary in a district that's gone to Democrats for more than 50 years. She's petite but when she walks into a room, she owns it. On a recent afternoon she's giving a rallying speech to volunteers. When she's introduced, she's met with raucous applause. 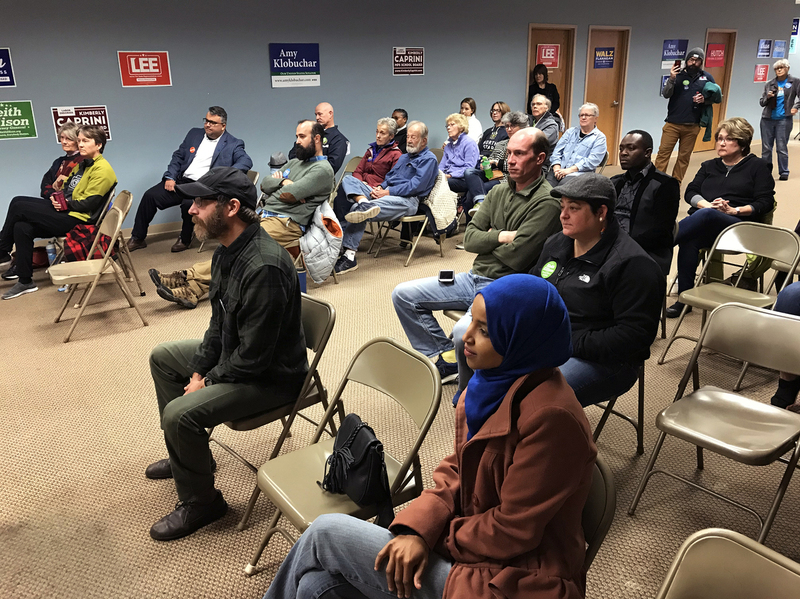 Ilhan Omar (lower right) sits with a crowd of volunteers and Democratic Farmer Labor party members. "As an immigrant I truly believed when I was coming to this country that people had the tools necessary to life to live a life that is prosperous, that is just and free," she said. The audience murmured in agreement. "So every single day I am shocked with the hypocrisy of this country. That we are the wealthiest nation in the world. But we cannot figure out how to house our homeless people. We can't figure out how to feed our kids in the school system." She'll be a lot of firsts if she makes it to Congress. The first refugee, the first Somali, the first Muslim woman. But that's not how she captured the enthusiasm of her mostly white district. She did it, she said, by talking directly to voters who share her values. The democratic socialist beat her closest opponent by over 20,000 votes. "For me as an immigrant who didn't speak the language, when I would have struggles as a kid my dad would say 'once you are able to communicate with people, they're able to connect with you beyond your otherness,'" she said. "That is really the message I've carried throughout my life." And it was the crux of her campaign, talking directly to voters who are like her and different than her. She says, she spends most of her time talking to people and doesn't depend on ads and fliers in the mail. 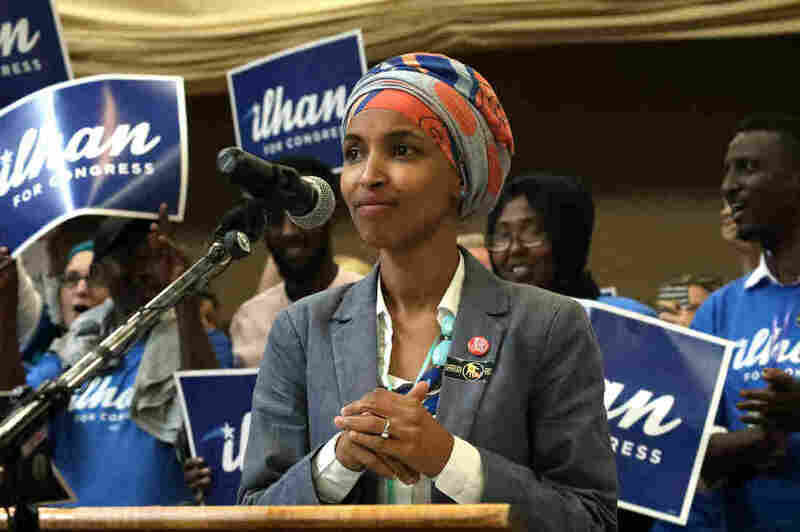 The strategy worked, because Muslims or Somalis alone didn't win her the primary or her current seat in the state house. "Seventy percent of the people I currently represent and the people that I will have the opportunity to represent in Congress are white," she said. "And you know nearly 90 percent of them are non-Muslims. And so it is important for me to get an opportunity to sit with folks, for them to have a discussion with me about their struggles and what's at stake." She calls her politics, the politics of moral "clarity and courage." Her platform includes canceling student debt, banning private prisons, registering new voters automatically when they're 18, passing the End Racial and Religious Profiling Act. And Somalis are particularly excited about her possible election to Congress. Minnesota is home to the largest Somali population in the country. At Karmel Mall, known as the Somali mall, cafes serve cardamom and cinnamon spiced coffee with condensed milk, women's clothing stores hawk colorful loose fitting dresses and men get groomed at barber shops. One person after the next says they plan to vote and to vote for Ilhan Omar if they're in her district. "I can't wait, to be honest," Kaltun Ali says. "For me it's personal to be honest. I am Somali and I am Muslim." The respiratory therapist is shopping for curtains with her daughter Nayla. This year, since the election of President Trump, she says, she's been afraid. "America became unsafe for us and very sad and racist and a lot of bigotry so I want to vote," she says. "I want to send my message that we have a voice." Her words underscored by last month's shooting at a synagogue in Pittsburgh that killed 11 Jewish people and the shooting of two African-Americans at a grocery store in Kentucky. Last year, a Minnesota mosque was bombed. "We are all American at the end of the day," Ali says. "If we're Somali versus white or any people versus another it's not safe for anybody."